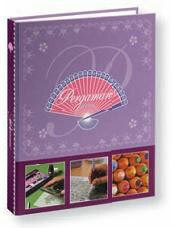 Perga soft is a special kind of wax which can be used on embossing and/or perforating tools. It makes embossing and perforating easier. Just drag the embossing or perforating tool over the wax lightly. Perga soft is influenced by temperatures. If it is cold the wax will be harder. If you keep it in a warm place it will be softer. Especially developed for the dorsing technique. With this technique you add colour to the parchment paper using the dorso crayons. The transparent caps provide excellent protection for your Pergamano tools. They can be used on all perforating and embossing tools. 5 caps. Bookmark sleeves will protect your parchment craft bookmarks from wear and tear. Free bookmark pattern included. 6 sleeves in the packet. Pergamano Coasters - four coasters in a pack. Use these coasters to display your parchment craft designs and use them as drinks coasters or make them as gifts for friends and relatives. Birthday calendar, A spiral bound A4 size calendar for you to finish. Includes designs by Anneke Oostermeijer and Nettie Kramer and work descriptions for 4 projects.